A gritty effort by an outmanned Texas Southern team was not enough. As with seemingly every #1 vs. #16 matchup in the history of this event, this game was a complete physical mismatch. But that did not stop Mike Davis’ Texas Southern squad from doing everything it could to make this one close. The Tigers easily could have been blown out early, as they fell behind 13-4 just four and a half minutes into the game. But they fought back to go on an improbable 16-0 run to take a 20-13 lead at the 12:13 mark of the half. Unfortunately for them, Xavier answered with a 36-11 run before the Tigers scored the final six points of the half to trail by 12 at the break. In the second half, the Tigers melted down a bit, and were called for three technical fouls over the span of about two minutes midway through. Perhaps one of these days, the upset will finally happen, but it was never a possibility in this one. J.P. Macura was on fire, and he let everyone know it. Macura is the guy who is easy for everyone who plays him to hate. The 6’5″ senior came out on fire, as he went 7-of-9 from the field in the first half, including 4-of-5 from three-point range in scoring 18 points in the frame. In fact, he scored all 18 during a 10-minute stretch in the middle of the half, and that spurt was the difference in the ballgame, as the Tigers were never able to really get back in the game. Macura also spent most of the half jawing at Texas Southern players and hamming it up for the Xavier fans seated across from the Musketeers’ bench. No one can say that he doesn’t have fun playing the game, and Friday’s first half performance was among the best of his successful career. He finished with a career-high 29 points on 5-of-6 shooting from behind the arc. Trevon Bluett and Kerem Kanter weren’t bad, either. Macura was the show in the first half, but all-American Trevon Bluiett had a nice game as well, as did senior center Kerem Kanter. Bluiett ended the night with a “quiet” 26 points, while Kanter added 24. Along with Macura, the three accounted for nearly 80 percent of the Musketeers’ offense. For the night, Xavier shot 55 percent, and went 11-of-24 from three-point range. Granted, it came against an outmanned Texas Southern team, but for Xavier to go deep in this Tournament, it will need more performances like this from its big three going forward. Anyone who is familiar with Xavier teams of recent years knows that Chris Mack‘s most frequently employed lineup features four perimeter players running a drive-and-dish philosophy that emphasizes excellent spacing. Given that the Musketeers typically have several shooters on the floor at any given time, it shouldn’t come as any surprise that the Musketeers are connecting on 39.1 percent of their perimeter shots (53rd nationally) this season. But the driver of the nation’s third most efficient offense isn’t the offensive rebounding acumen that has buoyed Mack’s last few groups; rather, this year’s team has taken a remarkable leap in its interior scoring. For the purposes of this article and particularly when applying it to Xavier’s four-out offense, interior scoring refers to shots at the rim in the half-court offense in addition to shots in the paint and transition-generated inside scoring. For a team that many figured would seek to replicate last year’s offensive scheme, there have been quite a few notable changes driving this season’s jump in efficiency. With the season just a week away, Rush the Court’s Big East preview will tip off its coverage by posing season-defining key questions for each team. Today we tackle Providence and Xavier. #4 Providence – How will the Friars fare with heightened expectations? For the past few years it seemed like the Friars, even with Kris Dunn, entered each season as an overlooked group with a chip on its shoulders. This perceived slight seemingly served as motivation, paving the way for four straight 20-win seasons with corresponding NCAA Tournament berths. 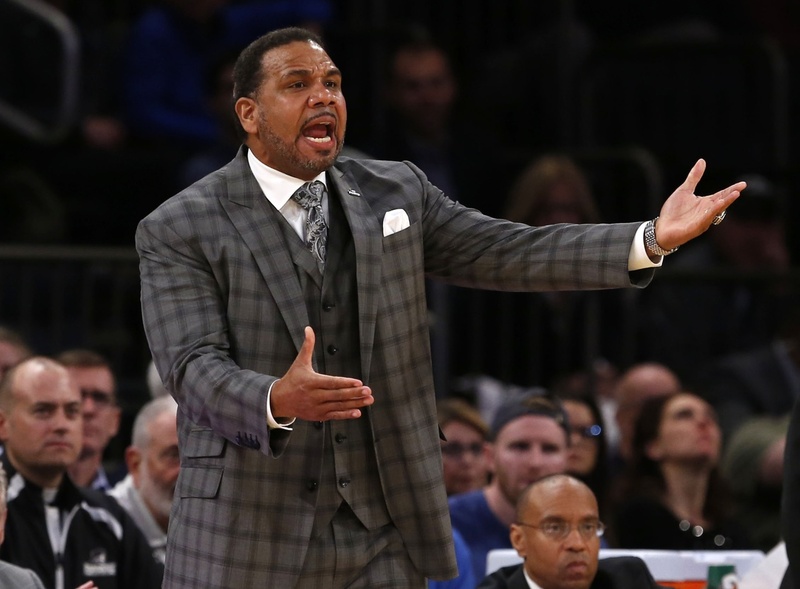 But now, after several years playing the underrated role, Ed Cooley‘s team in projected among the top tier of the Big East and even finding itself in several preseason Top 25 polls. And rightfully so. The Friars return every key contributor from last season’s 20-13 squad, although starting forward Emmitt Holt is out indefinitely with an abdominal issue. More importantly and regardless of the circumstances, the Providence program under Cooley has regularly exceeded expectations and addressed any uncertainties come March. Leading scorer Rodney Bullock (15.7 PPG) demonstrated an ability to shoulder the scoring load despite being the focal point of opposing defenses last season. Kyron Cartwright seamlessly stepped into the lead guard role vacated by Dunn, finishing fourth nationally in assists per game (6.7 APG). And Cooley’s deliberate pace (270th nationally) has played to the team’s strengths, letting Cartwright execute half-court sets while forcing opponents to churn the shot clock. So now that those questions have been answered, the key factor this season comes down to whether the Friars can take the next step up the ladder and play consistently enough from January to March to compete for the Big East regular season crown. Xavier Just Kept Coming. 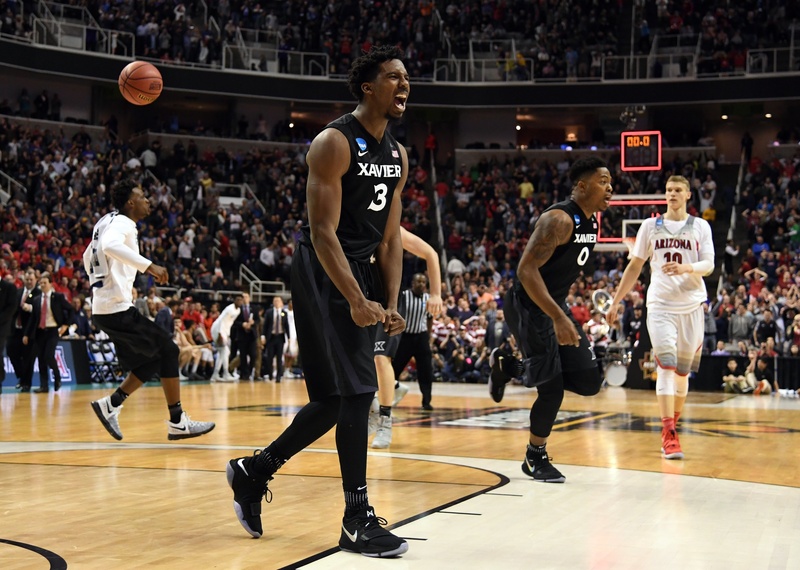 After starting the game down 7-0… after finding itself facing an eight-point deficit with 3:44 remaining… even after missing the front end of a one-and-one that could have salted the game away with 22 seconds remaining… Xavier kept coming. And it figures, given that this group of Musketeers — left virtually for dead after losing star guard Edmond Sumner to a season-ending injury at the end of January — have stared adversity in the face and laughed. Arizona desperately tried to put Xavier away in the second half, but Chris Mack’s club would never quite allow enough separation. That relentless nature of continually applying pressure ultimately caused Arizona to crack, sending the Wildcats back to the desert without a trip to the Final Four in Glendale attached. Arizona’s Home Stretch Offense. Say what you want about how Xavier put itself into great position to win with its relentlessness and its clever offensive sets — all true — but Arizona did not help itself by completely forgetting about Lauri Markkanen inside (his last shot came at 11:12 remaining in the second half) and over-relying on the hot hand of Allonzo Trier to carry them home. For an eight-minute period from 13:28 to 5:26 remaining in the game, Trier was cooking with some gas. He nailed six of his seven shots, including three three-pointers, in contributing 15 straight points for the Wildcats. He missed his final three attempts, all of which were jumpers. The problem with the strategy of letting Trier do his thing is that it basically killed the Arizona offense. The Wildcats’ final stretch included several awful possessions, including a post-up by Dusan Ristic that started behind the basket and a handful of other drives that turned into bad misses. During a point in the game when Arizona should have been executing to get fouls to hold its lead, it reeked of desperation to hold on for dear life. It was as if they were trying to wish the clock away rather than continuing to play. Sean Miller’s Early Career Legacy. 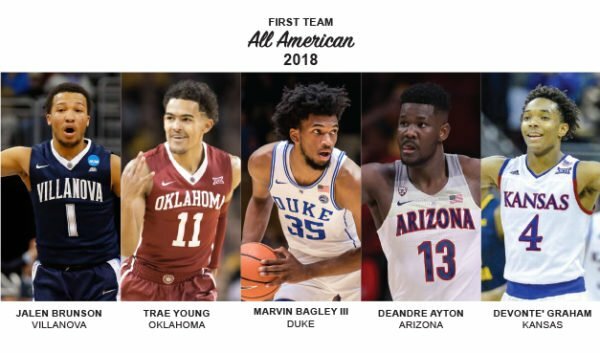 There will be a lot written about this topic in Arizona and beyond — some fair, some not — but the fact remains that Sean Miller’s early career at Arizona has been filled with great regular season success, multiple high NBA Draft picks, and a painful legacy in the regionals. Despite receiving some favorable draws in terms of location within the West Region geographic footprint — allowing for its formidable crowd to turn neutral-site arenas into Tucson West or North — it hasn’t seemed to help. Some will argue that Miller’s losses to the likes of Wisconsin in 2015 or Connecticut in 2011 were to outstanding teams that simply were not going to be denied. While a fair point, the fact remains that three of Miller’s four best teams (2011, 2014, 2017) have had the ball with the final possession yet still fell short. In all three of those games, late execution was a factor. At a certain point, a series of close devastating losses begin to weigh on a program as well as a head coach — it’s safe to say that we’re to that point in Tucson. The Wildcats played tight in the final four minutes today, and the fans all around the building could sense it. Star of the Game. Trevon Bluiett, Xavier. Bluiett carried the Musketeers in the first half, scoring 18 of his game-high 25 points on 7-of-8 from the field including a pair of threes. He was quieter in the second half, but he hit the big three to keep Xavier alive after they had gone down by eight points with just under four minutes remaining. He’s been outstanding in the NCAA Tournament, averaging 25.0 PPG and knocking down 47.8 percent of his three-point shots. New Favorite: #1 Gonzaga (34-1). If the Zags were the West region favorite before play started last Thursday, there’s no reason they shouldn’t continue to maintain that status. Sure, there were slow points in each of Gonzaga’s two victories over the weekend — namely, the first half against South Dakota State and the second half versus Northwestern – but Mark Few‘s team ultimately emerged from each unscathed. 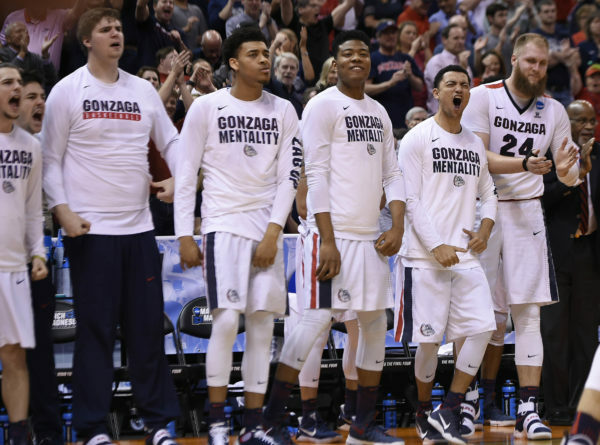 With West Virginia and possibly Arizona awaiting in San Jose, the road stiffens from here, but there’s no reason Gonzaga shouldn’t still feel like the front-runner. Horse of Darkness: #4 West Virginia (28-8). The Mountaineers enter the Sweet Sixteen as a scary team. Depth and pressure — two West Virginia hallmarks — carried it through early round victories over #13 Bucknell (86-80) and #5 Notre Dame (83-71). Now those strengths will be relied upon to harass #1 Gonzaga into an uncharacteristically turnover-heavy game. The Zags rank 26th in the country in lowest turnover percentage, but Notre Dame also led the nation in that category before the Irish turned the ball over on 21 percent of their possessions against Press Virginia (seven percent higher than their season average). 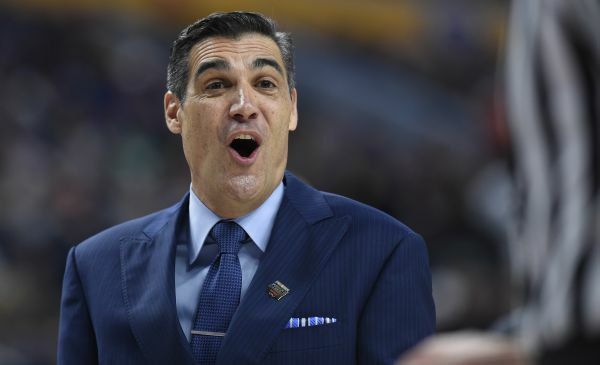 Gonzaga is also just an average offensive rebounding team, which limits its ability to take advantage of West Virginia’s biggest weaknesses — collecting defensive rebounds behind the press. The match-up is solid, the team is capable, and Bob Huggins is on the bench — in sum, the Mountaineers have a chance to surprise in San Jose. Biggest Surprise (First Weekend): #11 Xavier (23-13). Less than three weeks ago, Xavier was a sub-.500 Big East team that had lost six straight games. Its star point guard was lost for the season and hopes of another NCAA Tournament appearance flickered with each outing. Now, on March 21, the Musketeers are fresh off a 25-point Second Round rout of Florida State and is back in the Sweet Sixteen. 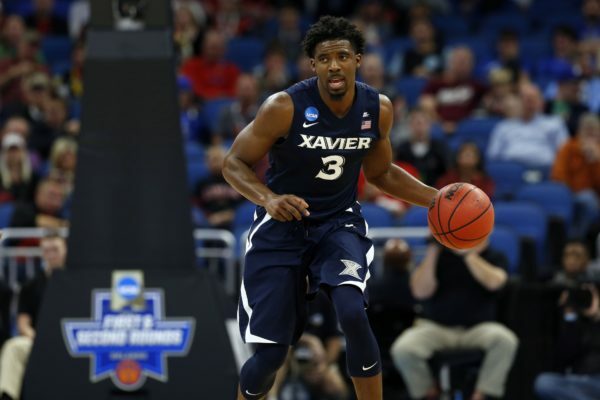 Xavier is a fantastic piece of proof that things can change quickly in March, but the verdict on this Musketeers’ season won’t be altered negatively from here on out: A remarkable turnaround last weekend saved a season. Rush the Court is providing NCAA Tournament coverage from start to finish over the next three weeks. Xavier’s outside shooting was incredible. There are games when teams just catch fire from the outside and an opponent can do nothing to stop it. That occurred tonight with Xavier, as the Musketeers finished the game hitting a scorching 64.7 percent from the three-point line. What made this performance so impactful is that it was not just one guy who caught fire — the entire team contributed. Five different Musketeers connected from long range with reserve freshman forward Kaiser Gates leading the way with four conversions. 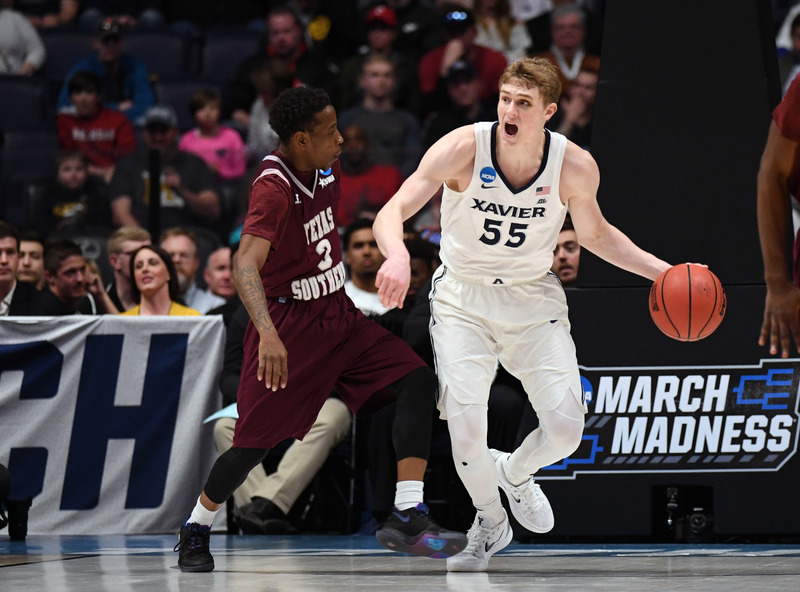 Xavier’s marksmanship thus far in the NCAA Tournament — 50 percent through two games — is completely unexpected, as the Musketeers finished the regular season ranked 211th nationally at just 33.0 percent. It will be interesting to see if Xavier is able to keep up the hot shooting next week in San Jose. Florida State’s performance left plenty to be desired. Las Vegas made Florida State a 7.5-point favorite entering tonight’s game with good reason. The Seminoles have legitimate NBA talent across the roster in guards Dwayne Bacon and Xavier Rathan-Mayes, along with forward Jonathan Isaac. Having that kind of talent advantage did not do them any good, though, as Xavier dominated the game for the entire 40 minutes. Florida State looked ill-prepared on both ends of the court, as it took bad shot after bad shot on one end and allowed the Musketeers open looks on the other. It also seems dumbfounding how the Seminoles have a player like Isaac — currently projected to be the ninth pick in this summer’s NBA Draft — manage only seven shot attempts. Florida State was a bit on an enigma for the entire season, and many doubted its ability win away from Tallahassee, so losing in blowout fashion to a #11 seed proves that those concerns had merit. Xavier’s chance in the Sweet Sixteen should not be discounted. A lesson the NCAA Tournament has taught college basketball fans since its inception is to never discount a hot team. Right now, despite being an overlooked #11 seed that lost six of its last seven regular season games, the Musketeers certainly qualify. Bluiett has been excellent in the NCAA Tournament, while supporting players such as guard J.P. Macura and forwards Tyrique Jones and Sean O’Mara have provided terrific complementary performances. 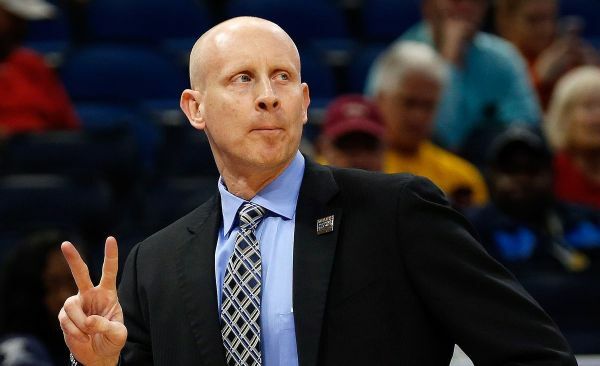 Chris Mack has shown time and time again that he should be considered among the country’s best tacticians, and despite losing point guard Edmond Sumner for the season in late January, his team regrouped and found a way to advance to the NCAA Tournament’s second weekend. Player of the Game. Trevon Bluiett, Xavier. The junior forward turned in another star performance in the victory, finishing the night with 29 points on a very efficient 8-of-14 shooting. Bluiett’s length in Xavier’s 2-3 zone also bothered Florida State’s offense all night, which aided with the Seminoles only shooting 40 percent for the game. 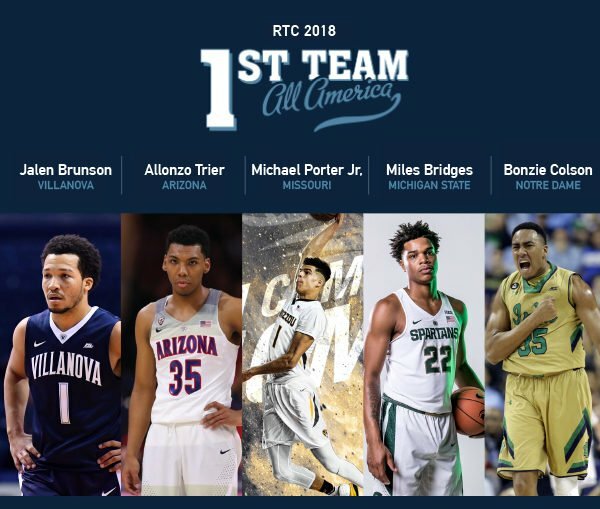 Bluiett has been a standout player for much of his career at Xavier, but he has taken his game to another level in this year’s NCAA Tournament. A hot Trevon Bluiett is nearly unstoppable. There are some players who just need to see the ball go in the net once for their games to completely turn on a dime. That situation happened with Xavier junior forward Trevon Bluiett in tonight’s victory, as he was able to shake off a poor first half (just three points on 1-of-8 shooting) and completely dominate the second stanza in his team’s favor. Bluiett scored 18 of his game-high 21 points after the break, reaching a point where everyone in the gym knew anything he shot was likely going in. Bluiett’s second half tear carried over from his performance at last week’s Big East Tournament when he scored 44 of his 58 points after halftime. Xavier will undoubtedly take Bluiett warming up after halftime if it means more victories, but the Musketeers have to wonder what it would mean if Bluiett was hot for an entire game. Sean O’Mara came off the bench to provide Xavier a consistent post presence. It would make sense if Sean O’Mara had not been a key component of Maryland’s incoming scouting report. The junior big man entered today’s contest averaging a modest 5.5 points and 2.8 rebounds per game, as Xavier is far better known for its perimeter attack than its interior play. You better believe Maryland knows a lot about O’Mara now after he turned in a career-best performance in the 11-point victory. O’Mara finished the game with 18 points (5-of-6 FG and 8-of-9 FT) and seven rebounds. The Terps had no answer for his work in the post, as big man Damonte Dodd struggled all evening and was exploited by the far more athletic O’Mara. Maryland was overseeded. It is easy in hindsight to point to problems with how certain teams were seeded, but anyone who watched today’s game will tell you that Maryland was not worthy of a #6 seed. The Terrapins were disjointed for much of the game on both ends of the court, and it often appeared that they were just waiting around for junior guard Melo Trimble to make a play. This was a questionable strategy because Trimble struggled all night, finishing with 13 points on just 5-of-15 shooting. The bracket cannot be changed in retrospect, but you have to think the NCAA Tournament may have been a little better if the Terrapins were actually placed where they belonged. Player of the Game. Trevon Bluiett, Xavier. The game changed for the Musketeers when Bluiett got going in the second half. The junior Indianapolis native finished the game with 21 points (7-of-15 FG and 5-of-10 3FG) and made his presence felt on the defensive end by nabbing three steals. Bluiett was the best player on the floor throughout the second 20 minutes and Xavier’s win would not have been possible without him coming alive.